1. Fix a possible crash if there are more than 40 video modes. 2. Attempt a windowed mode before giving up. 3. List all video modes in S8report.txt. This is found in either the main id1 folder, or the mod folder if playing a mod. Please attach if reporting a crash or bug. Custom hud element location adjustment through cvars. Cheesy but easy. Ignore sv_cheats in singleplayer, if no repercussions. Howdy! Loving this Quake engine, just found it last night. Feels nice and solid, less floaty than the gl engines. I've been trying to setup a dedicated server with this engine for multiplayer deathmatch and I keep getting an error when the first client connects to the server that crashes the server / disconnecting the client. The console on the client has a error that states "can't find track00" or something close to that. I can post the exact error later today. Have you ever tried using this engine for multiplayer and or setup a dedicated server on windows using this engine? I've played multiplayer, but not as a dedicated server in a long time. If you post the error I'll take a look. On the server there may be a s8report.txt file in id1 folder with a message as well. The 'can't find track' on the client is just a music track. m_side[value] Strafe speed with mouse. m_forward[value] Forward and reverse mouse speed. Warning - do not set directly. crosshair_color[0-17] 0-15 are built-in colors, 16 is crosshair_custom1, and 17 is crosshair_custom2. cmdline[string] command line read by stuffcmds for dynamic mod loading. 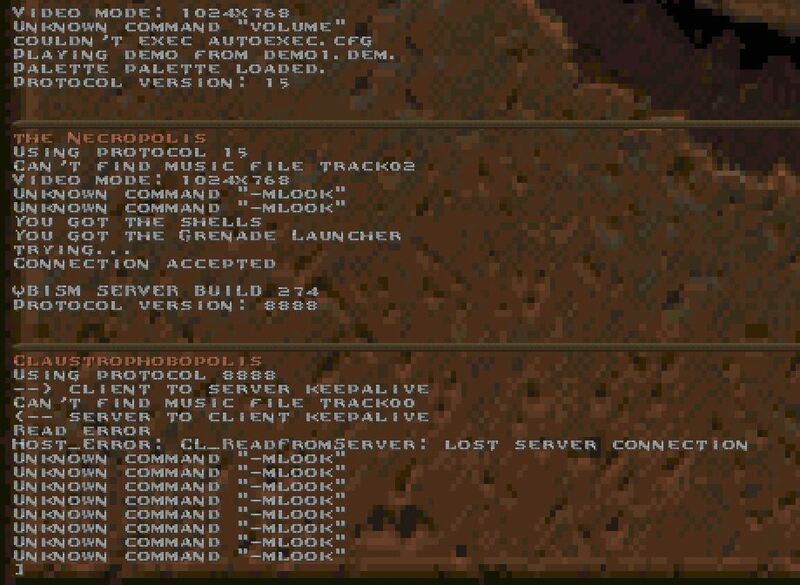 registered[0/1] 0 is shareware, 1 is full game version. gamma [value] Sets the darkness level. Lower values are brighter. Recommended range is 0.7 to 1.3.
crosshair[0-5] Crosshair type. 0 is off. "can't find music file track00". Thanks, I was able to duplicate this. In fact both client and server crashed simultaneously for me. It's going to take some digging. 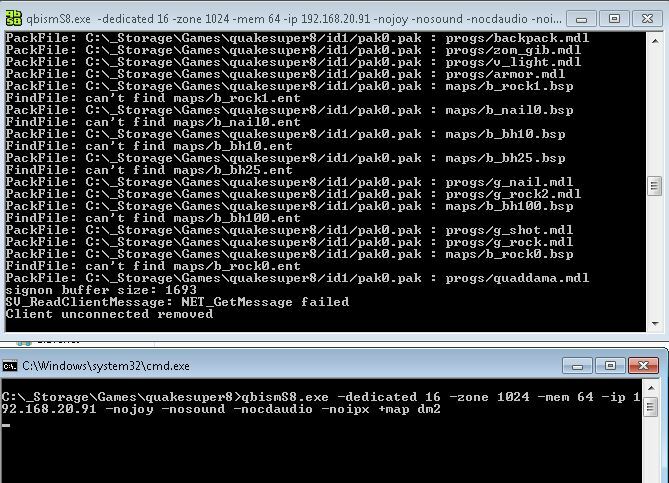 For now, could try proquake or other dedicated server. Also won't look weird anymore with original maps or old maps with non-vised water. But can fake water alpha with r_novis 1 and sv_novis 1 in the console (works for single-player only). Network play still not working for me, here are some screenshots of the issue now. No more crashing on the server or client, but now the client just gets stuck at console. Now the server/client don't crash, but the client will not connect correctly, see the second screenshot for error. When running dedicated server there is no S8report.txt generated. I tried running a listen server as well, and that did not work. r_ambient[value] Set minimum value for map lighting. pr_checkextension[0/1] Warning- set internally by the engine. Enable qc check for extensions. skill [0-3] – Set the skill level of the game.